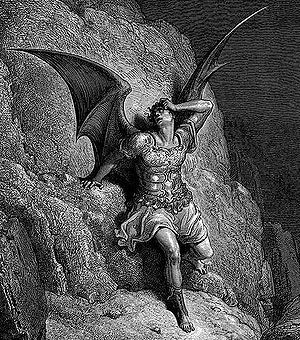 Gustave Doré's depiction of Satan from John Milton's Paradise Lost. Satan or the Devil is the embodiment of evil. Satan plays a major role in Christian theology and literature, and in other religions under different names. He is the tempter and spiritual enemy of mankind. He is the adversary of God, although subordinate to Him and able to act only by his sufferance, and is represented frequently as the leader or prince of all apostate angels and as ruler of hell. "Satan is the force that loves to find the guilt and weakness in people, to humiliate them with it, to convince them that, because they are not good, God cannot love them." Leftist Saul Alinsky dedicated to Lucifer his book Rules for Radicals, which inspired some liberal activists. Satan was once a member of the divine council of God referenced in the Old Testament. He is referenced 11 times in Job and 4 other times in the Old Testament. The New Testament mentions Satan 34 times in all, starting with the first book Matthew and ending with the last Revelation. In the Christian tradition, he rebelled against God and is now the enemy of God and man alike. He is the father of lies, and no good is found in him. He leads a host of fallen angels, (or demons), who know their days are numbered before they will be cast in the lake of fire, so they seek to take as many humans as possible with them. In the New Testament, Satan tries to tempt Jesus in the desert, and fails. Jesus warns extensively to beware of Satan, as does Paul. In Christian theology, Satan's goal is to lead people away from the love of God, by tempting or tricking them. The only sources of supernatural power in the world are from either God (good) or Satan (evil). In the book of Genesis, Satan takes the form of a snake and tempts Eve with fruit from a tree. This causes sin to come into the world. Kelly (2006) demonstrates how assumptions—such as the identification of the Eden serpent with Satan, probably first made by Justin Martyr in the second century—have hardened into fact. Satan, in the Book of Job, listens to God speak highly of Job and accuses Job to God before the host of angels that Job praises God only because he is blessed and would curse God if he was forced to suffer. God allows Satan to do what he will except to spare his life, and Satan causes Job to suffer immensely. (Job remained true to God through his hardships; Satan accused him further and punished him further, but could not get Job to break). Jesus makes references to demonic possession on multiple occasions that He then casts out. Some believe that Satan is able to possess and control living humans on Earth even today. Even more, some others believe that Satan actually has done this in the past as well. Specifically, Satan is said to have entered Judas during The Last Supper (John 13:27). The Catholic church believes that priests (and sometimes only bishops) are able to exorcise this possession through Jesus. The word Satan derives from the Hebrew "ha-satan", meaning the "accuser", "tempter", "persecutor", "calumniator", or "adversary". He "was a liar and a murderer from the beginning." (John 8:44) Synonyms include Lucifer, The Devil, Mephistopholes, Mephisto, Beelzebub, the Evil One, the Tempter, and The Prince of Darkness. The term "demon" generally refers to one of the fallen angels who join into Satan's attempt to overthrow God. The adjectives include "devilish," "demonic", and "diabolic". Those who worship Satan are called Satanists, Satan-worshippers, devil-worshippers, or demonists. Lucifer is a name literally meaning "Son of the Morning" (or "Light-Bearer"), and is mentioned in the Bible only in the book of Isaiah (Isaiah 14:12). Though in Christian tradition Lucifer is equated with Satan, the immediate context of the passage is Isaiah's prophecy against the king of Babylon, Nebuchadnezzar, and the name "Lucifer" was not present at all in the original manuscripts (in the Latin Vulgate, the phrase "Son of the Morning" was transliterated as a proper name). Those who take this passage to be a reference to Satan believe that it gives more history of what caused his downfall, that he was created by God as one of His most powerful angels (possibly a Seraph), but that he fell from grace after he in his pride rebelled against his Creator. Some, however, believe that there is no grounding to interpret the passage as a history of Satan, citing that the passage uses highly figurative and poetic language that was meant as a prophecy against Babylon and nothing more. The fall of Lucifer by Gustave Doré. Literally "lord of the flies," this is believed to be a deliberately insulting perversion of the name "Beelzebul." Literally "Lord of Heaven" or "Lord of the House," this name is believed to have originated from the name Baal-Zebul, and may refer to the god of Ekron (see 2 King. 1:2-3). In the Jewish tradition, Satan is an angel who faithfully serves God as a prosecuting attorney — one who accuses men of wickedness and impiety. At the direction of God, Satan may be permitted to test these accusations, such as in Job. In this view, Satan's goal is not to lead men away from their faithfulness to God, but merely to reveal the true depths of their devotion, although in I Chronicles 21:1 Satan provoked David to take a census of the people of Israel against the will of God and 70,000 men are slain because of it. II Samuel 24:1 supports the view of Satan as God's prosecuting attorney by reporting that it was the Lord Who moved David to take the census; the two passages can easily be reconciled if Satan acted as God's agent. Jehovah's Witnesses believe that Satan was at one time an angel who lived among the many millions of Angels that existed before the world was created. They believe that at some point he developed the desire to be worshiped by humans and other angels and so set himself in opposition to worship of Jehovah, his God and Father. This they believe occurred in the Garden of Eden, and not prior to the Earths creation. Jehovah's Witnesses teach that Satan used a serpent as his mouthpiece, the same way a ventriloquist uses a dummy, to bring the first human couple under his control. Jehovah's Witnesses teach also that God decided that time, rather than a display of force, is needed to settle these issues. This, they believe, has giving Satan thousands of years to prove that Mankind is better off without God, that He (Satan) can rule Mankind successfully, and that the Humans that Do serve God do so only out of selfish reasons. Jehovah's Witnesses teach that Satan does not live in any kind of Hell or world of the dead, but on the Earth as it's current ruler, along with as many as a third of the Angels of Heaven. They teach that Satan had lived in Heaven up until 1914, when Jesus and his Angels cast him out of Heaven, bringing woe to the Earth. this is their reasoning on Why the world has experienced two World wars, increasing lawlessness, an increase in disease and pollution, and the overall conditions on earth today. Jehovah's Witnesses believe that Satan delegates authority to each Demon as he see's fit, and over what he see's fit, sometimes including whole Nations and kingdoms. They believe that Satan and his demons are in every way the enemy of God, rather than working alongside him. They teach that Satan will continue to rule the world until Armageddon, when Jesus Christ and his heavenly Angels come to earth and bind him, eventually killing him, freeing the world of all opposition towards True worship. the Holy Spirit, meaning "The Advocate" (i.e., defense lawyer), or the Armor of God. Note that Satan lacks self-restraint, which often leads him to failure. In addition, Satan delights in deceit, even to the point of causing his downfall. Some national literary depictions of Satan have become highly regarded classics, but by a strange coincidence of causes are presented by their authors, to a man, in their native language rather than a Classical language. The first part of Medieval Italian Dante Alighieri's three-part poem, The Divine Comedy (1320), known to all in the set phrase "Dante's Inferno" (pronounced Dan-tay). John Milton's English poem, Paradise Lost (1667). Johann Wolfgang von Goethe's German play Faust (1831). These three are considered among the greatest poems of their respective literatures. Christopher Marlowe's English play, The Tragical History of Doctor Faustus (1604). Lucifer (1654), play by Dutch author Joost van den Vondel. In Western art and popular culture the devil is used to represent evil influences or motivations. Some writers have pointed out that a few popular depictions of Satan are similar to that of Prometheus. Osborne, B. A. E. "Peter: Stumbling-Block and Satan," Novum Testamentum, Vol. 15, Fasc. 3 (Jul., 1973), pp. 187–190 in JSTOR on "Get thee behind me, Satan!" ↑ Werblowsky, Raphael Jehudah Zwi. Lucifer and Prometheus: A Study of Milton's Satan. Routledge, reprinted 1999 and 2001; originally published 1952. This page has been accessed 123,943 times.